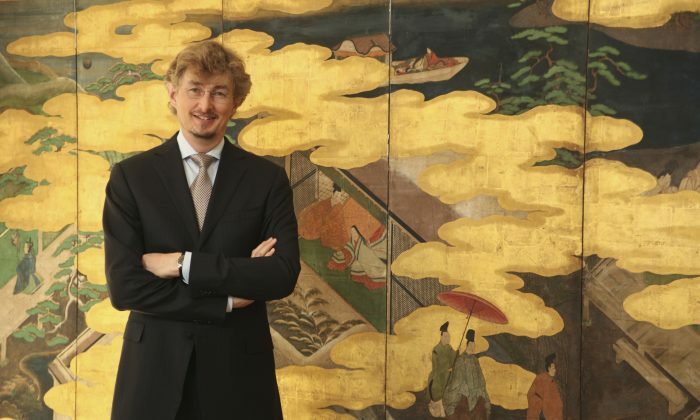 Erik Thomsen has been a dealer in Japanese art since 1981. Born to Danish parents and raised in Japan, he is fluent in Japanese. The Erik Thomsen Gallery is located in the Upper East Side of Manhattan. Q: How did you get into the field of Japanese art? A: I grew up in Japan, where I went to local schools until the age of 10, and Japanese was my first language. After my graduate studies I apprenticed to an art gallery in Tokyo, initially to improve my Japanese, but I soon decided to become a dealer in Japanese art, almost 30 years ago. Q: What are the areas of Japanese art that are gaining attention now? A: Alongside perennial favorites such as hanging scrolls, these days we’re seeing a lot of interest in art from the early 20th century, in particular in lacquer, bamboo art, and paintings from the Taisho era (1912–26). The museums and collectors are beginning to devote their attention to more recent work, away from the Edo period (1615–1868) and into the twentieth century. Q: Who are the primary collectors of screens? A: We sell screens mainly to American collectors and museums. It’s important to remember that for the Japanese a screen is just one of several different painting formats, and that serious collectors of screens therefore also collect hanging scrolls, hand scrolls, and other types of painting. Smaller format screens, such as tea screens, generally go to private collections, whereas pairs of full-sized screens, which measure about 6 x 12 feet each, are collected by museums or collectors with large homes. Q: Any advice for how to display and enjoy screens? A: Collect many of them so that you can change your display to match the season, just as the Japanese do. I prefer to show them on a stand, slightly folded to bring out the best in the composition, but screens can also be mounted flat on the wall using rails. A pair doesn’t have to be displayed side by side but will often look good facing one another across a space. Q: Please share your top 5 criteria for buying screens. A: The value of a screen is determined by its design, quality, age, artist, and condition. However, your passion should be the deciding factor when buying screens or any art. Q: Anything else you feel our readers should know? A: Yes! Japanese art is a steal compared to Chinese and other Asian art. Prices are still surprisingly low, even for major works by great artists and now is a great time to collect.